On our road-trip Brin and I were only in Maryland two days and one of those was for a client event. We arranged to meet up with Honoré after the event for an early dinner in Columbia at Greystone Grill. ( I had dessert for dinner, YUM-O). She and Gail have known each other for years and Honoré and Brin met for the first time. It was quick but perfect! And she brought me an entire blue Ikea bag filled with books. Not just ANY books but every one of them is about writing. The most awesomest gift ever! Here they are ready to be sorted and added to my bookshelves. Thank you so much dear Honoré! Not long after we arrived home from our road-trip I received an unexpected package from Kathy. Hmmmmm….what could it be? 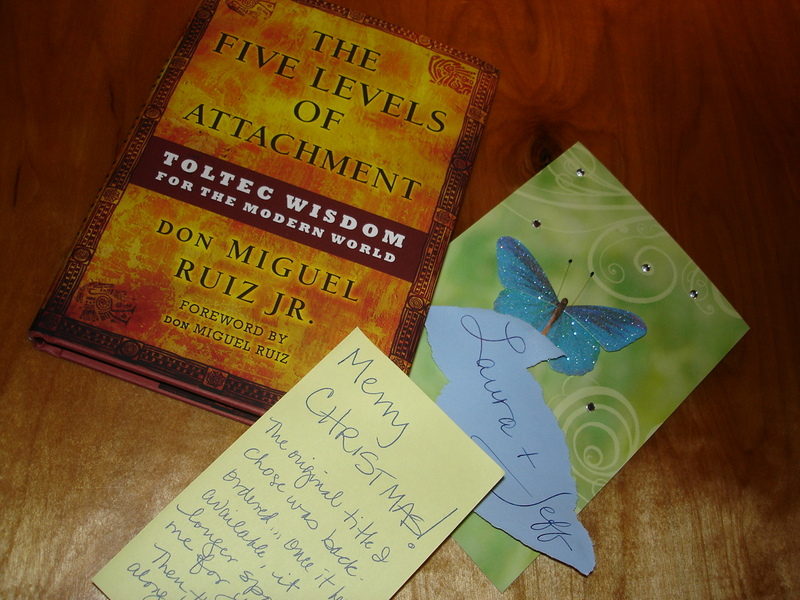 A lovely Easter card received in May, with a note wishing me and Jeff a belated Merry Christmas and a book of course! 1) I await anxiously to see your art 2) we can pretend to be in middle school anytime we want. Thank you sweet Kathy—the entire package made me smile big at your creative thoughtfulness and playfulness. 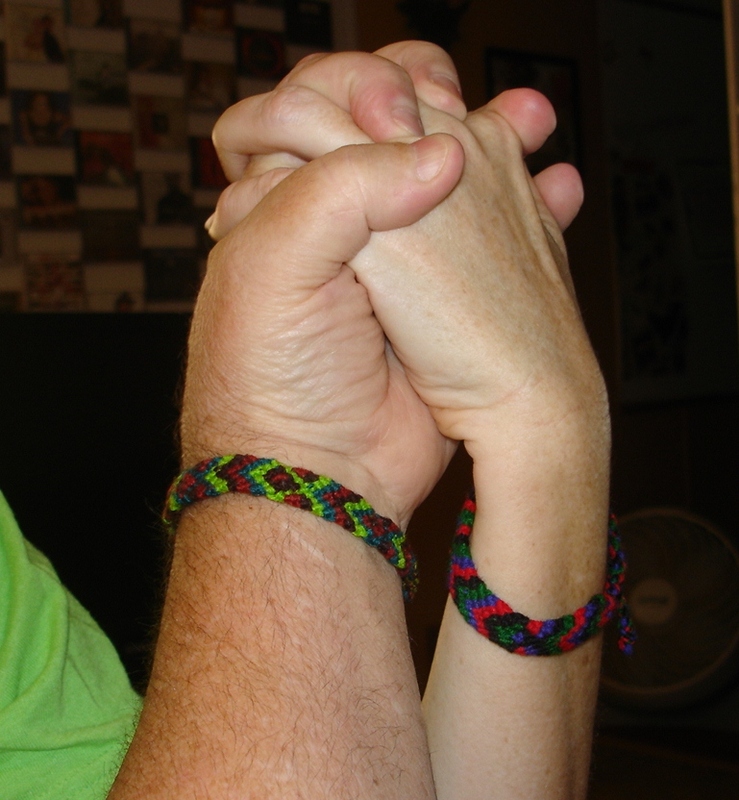 And Jeff and I have both worn our bracelets since we received them. 09 Jun	This entry was written by Laura and published on June 9, 2013 at 11:34 am. It’s filed under Books, Celebration, Connections, Friendship, Gift, Gratitude, Just for fun, Laura, Lifeology, Relationships, Travel. Bookmark the permalink. Follow any comments here with the RSS feed for this post. Hey Lady! How lucky we are to have you as our friend! 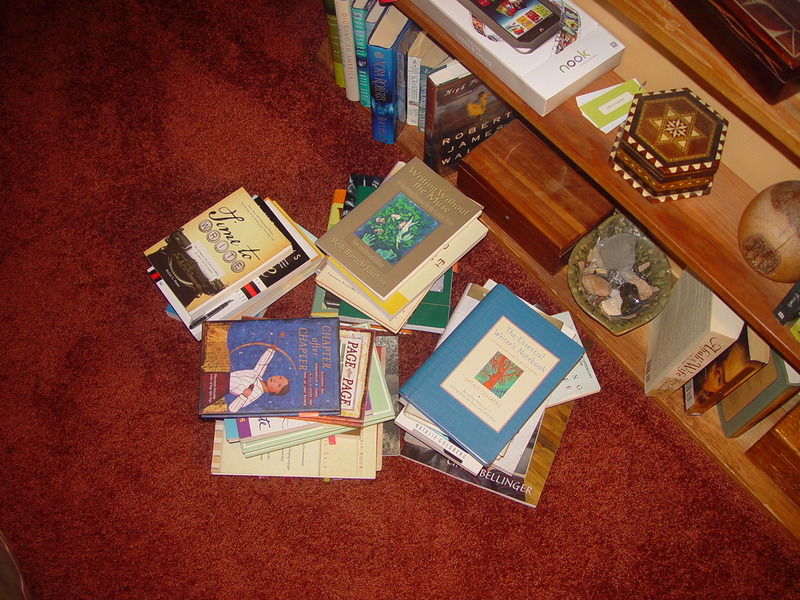 So glad to know the books are just exactly where they belong! Write on!